One of Mulco’s technical highlights is red. Its name: SYNCHROFLEX® GEN III. This colour symbolise the dimensionally true and high load resistant polyurethane timing belt from the Mulco-Europe EWIV group member ContiTech. 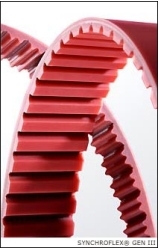 Due its typically red polyurethane high performance mix, bifilar steel cord tension members and denser wire packing SYNCHROFLEX® GEN III offers an up to 25% higher power transmission compared to standard belts. Mulco stress the number of special features of Synchroflex® GEN III: notably increased performance, longer operating life, perfectly straight run, enhanced abrasion resistance, and minimised running noise at a reduced timing belt width. GEN III can be employed at ambient temperatures of up to 100° C and runs in standard AT or ATP pulleys respectively. Another positive side effect of this proven high performance polyurethane mix, which is highly valued by designers of high torque drives is that due to the increased hardness the circumferential force is distributed over up to 30% more teeth.